Rutgers Global Health Institute’s efforts to confront the brutal inequality in cancer care in Botswana are part of a larger Botswana-Rutgers partnership that aims to create transformational change throughout the country. Rutgers is dedicated to serving New Jersey—and the world. 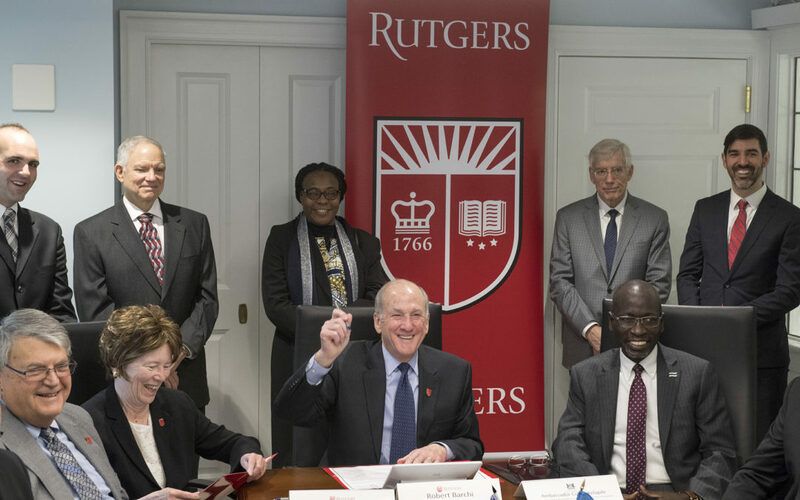 Rutgers University and Botswana leaders signed an agreement to launch the Botswana-Rutgers Knowledge Collaborative, a joint initiative to exchange knowledge through technology and develop programs that help Botswana address its strategic development goals as the country emerges as a regional hub of southern Africa. Led by Botswana President Mokgweetsi Eric Masisi and Rutgers President Robert L. Barchi, the broad partnership will focus on health care, information technology, higher education and research, entrepreneurship and innovation, civic leadership and other needs to help Botswana transform from a predominantly natural resource-based economy into a knowledge-based one. Read the full story in Rutgers Today. Rutgers Global Health Institute is a universitywide convener and catalyst. We advance and implement global health efforts across disciplines, schools, and campuses.